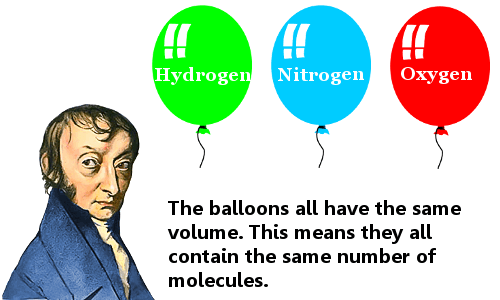 Amedeo Avogadro is best known for his hypothesis that equal volumes of different gases contain an equal number of molecules, provided they are at the same temperature and pressure. His hypothesis was rejected by other scientists. It only gained acceptance after his death. It is now called Avogadro’s law. Avogadro was also the first scientist to realize that elements could exist in the form of molecules rather than as individual atoms. Amedeo Avogadro was born in Turin, Italy, on August 9th, 1776. His family background was aristocratic. His father, Filippo, was a magistrate and senator who had the title of Count. His mother was a noblewoman, Anna Vercellone of Biella. Amedeo Avogadro inherited the title of Count from his father. In fact, Amedeo Avogadro’s full name was Count Lorenzo Romano Amedeo Carlo Avogadro di Quaregna e di Cerreto – quite a mouthful! Avogadro was highly intelligent. In 1796, when he was only 20, he was awarded a doctorate in canon law and began to practice as an ecclesiastical lawyer. Although he had followed the family tradition by studying law, he gradually lost interest in legal matters. He found science was much more intellectually stimulating. Mathematics and physics in particular attracted his logical mind. He spent increasing amounts of time studying these subjects. He was helped in this by the prominent mathematical physicist Professor Vassalli Eandi. In 1803, in cooperation with his brother Felice, Avogadro published his first scientific paper, which looked at the electrical behavior of salt solutions. This was state-of-the-art science: only three years earlier, Avogadro’s fellow Italian Alessandro Volta had invented the electric battery. In 1806, aged 30, Avogadro abandoned his successful legal practice and started teaching mathematics and physics at a high school in Turin. In 1809 he became a senior teacher at the College of Vercelli. In 1820 Avogadro became professor of mathematical physics at the University of Turin. Unfortunately, this post was short lived because of political turmoil. Avogadro lost his job in 1823. Avogadro was reappointed in 1833 and remained in this post until, at the age of 74, he retired in 1850. Although he was an aristocrat, Avogadro was a down-to-earth, private man, who was quietly religious. He worked hard and his lifestyle was simple. His wife’s name was Felicita Mazzé. They married in 1818 when Avogadro was aged 42. They had six sons. In the early 1800s, scientists’ ideas about the particles we now call atoms and molecules were very limited and often incorrect. Avogadro was deeply interested in finding out how the basic particles of matter behave and come together to form chemical compounds. In 1808 John Dalton published his atomic theory proposing that all matter is made of atoms. He further stated that all atoms of an element are identical, and the atoms of different elements have different masses. In doing so, Dalton carried chemistry to a new level. But he also made mistakes about the way elements combine to form compounds. For example, he thought water was made of one hydrogen atom and one oxygen atom and wrote it as HO; today we know water contains two hydrogens to every oxygen and we write water as H20. Actually, Avogadro figured this out, as we shall see. In 1809 Joseph Gay-Lussac published his law of combining gas volumes. He had noticed that when two liters of hydrogen gas react with one liter of oxygen gas, they form two liters of gaseous water. All gases that he reacted seemed to react in simple volume ratios. In 1811 Avogadro published a paper in Journal de Physique, the French Journal of Physics. He said that the best explanation for Gay-Lussac’s observations of gas reactions was that equal volumes of all gases at the same temperature and pressure contain equal numbers of molecules. This is now called Avogadro’s law. He published it when he was working as a physics teacher at the College of Vercelli. In this reaction three particles (two hydrogen molecules and one oxygen molecule) come together to form two particles of water… or 200 particles react with 100 particles to form 200 particles… or 2 million particles react with 1 million particles to form 2 million particles… etc. The observable effect is that after the reaction, when all of the hydrogen and oxygen gases have become H20 gas, the volume of gas falls to two-thirds of the starting volume. As a result of these observations Avogadro became the first scientist to realize that elements could exist as molecules rather than as individual atoms. For example, he recognized that the oxygen around us exists as a molecule in which two atoms of oxygen are linked. Other scientists in the field, such as Dalton, believed that only compounds could form molecules while all elements existed as single atoms. Avogadro realized that elements could exist in the form of molecules with individual atoms joined together. In 1815 Avogadro published a further paper in Journal de Physique discussing the masses of atoms, their compounds, and their gas densities. In 1821, as professor of mathematical physics at the University of Turin, he published a further paper looking at the masses of atoms and the proportions in which they combine. Between 1837 and 1841 Avogadro published four weighty volumes looking in detail at the physics of matter. Avogadro’s findings were almost completely ignored until Stanislao Cannizarro presented them at the Karlsruhe Conference in 1860, four years after Avogadro’s death. This conference had been called to remedy the scientific confusion that existed about atoms, molecules, and their masses. Even after Cannizarro presented his work not all scientists agreed with it. Another decade passed, with continued strong advocacy from Cannizarro, before Avogadro’s hypothesis became more widely accepted and became Avogadro’s Law. Today Avogadro is regarded as one of the founders of atomic-molecular chemistry. Why Was Avogadro’s Hypothesis Rejected For Decades? • He published his work in Journal de Physique, which had only a few readers. • The theories of better known scientists of the time, like John Dalton and Jöns Jacob Berzelius, disagreed with Avogadro’s work. • Italy – the country of Leonardo da Vinci and Galileo – was no longer regarded as a country where great science was done. Realizing this, a few years earlier, Avogadro’s compatriot Alessandro Volta had traveled out of Italy to make himself and his work known to scientists in other countries. Avogadro stayed in Italy and did not make personal contact with foreign scientists to help bridge the gap as Volta had done. Even though we like to think of science as a noble endeavor, where the truth will quickly become obvious, this is not always the case. Scientists are just people; they can be stubborn, as we all can be at times. If you have a controversial new scientific theory, and you are not well-known, it seems that personal contact can sometimes achieve as much as a scientific paper – or even more. Avogadro’s constant is one of the most important numbers in chemistry. Its value is 6.02214129 x 1023. Avogadro did not calculate this number, but its existence follows logically from his hypothesis and work. Avogadro’s constant is the number of particles (atoms or molecules) in one mole of any substance. For example, 12 grams of carbon contains 6.02214129 x 1023 carbon atoms. Avogadro’s constant is an enormous number. If you could save a million dollars a second, it would take you longer than the universe is believed to have existed to save 6.02214129 x 1023 dollars; which all goes to show that it takes a lot of atoms to make a small amount of matter! Amedeo Avogadro died aged 79 on July 9th, 1856 in Turin. He was buried in the cemetery of Quaregna. Images of Avogadro colorized and enhanced by this website. “Amedeo Avogadro.” Famous Scientists. famousscientists.org. 12 Jan. 2015. Web.